Bright, spacious living room with plenty of comfortable seating. Open concept kitchen and dining w/ doors to one of two decks. 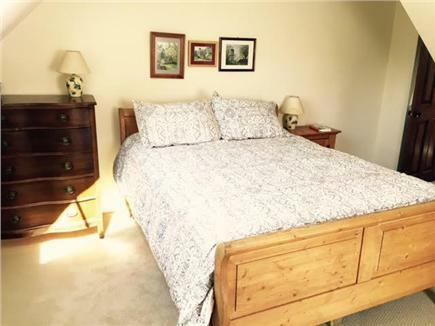 Large 1st floor master bedroom with king-size bed & sitting area. 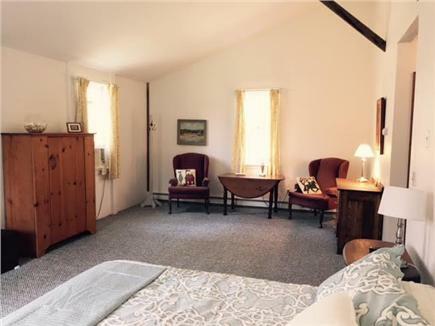 Abutting the Cape Cod National Seashore, Winterwood is a beautifully restored, 19th century barn (formerly a popular bed and breakfast inn). 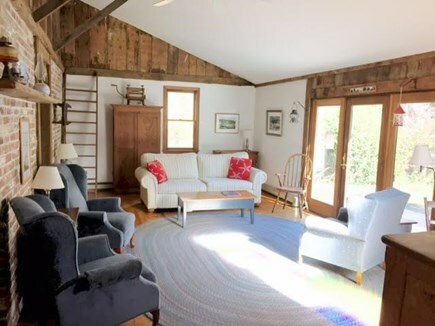 Set on wooded grounds in a superb location, you can walk to the quaint village of Wellfleet with its multitude of shops and galleries or meander through the woods to freshwater and secluded Dyer Pond (there is no public parking). It's just a short drive to ocean and bayside beaches. Winterwood is located on a dirt road (off Long Pond Road). So, while you're close to all that Wellfleet and the Outer Cape has to offer, the location affords a wonderful sense of privacy. The living area is open concept and very bright and sunny. 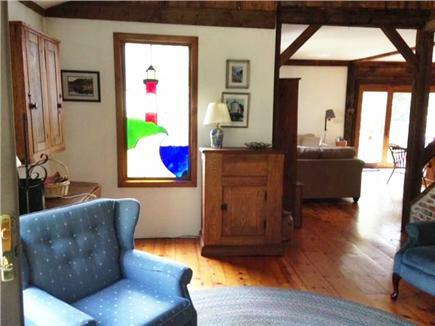 The airy living room has exposed beams and French doors to a second deck. 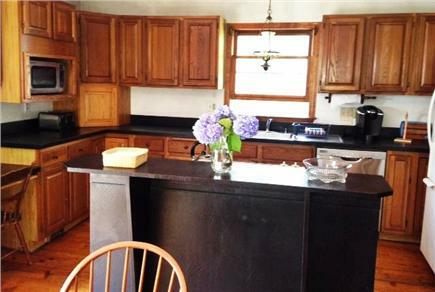 The fully-equipped kitchen has a large, farm-style dining table that comfortably seats 8 people. French doors lead to the deck off the dining area (gas grill on deck). There is a den area (with cable TV/DV). There is also a half bath (and laundry) on the first floor. There are 2.5 bathrooms and a large, enclosed outdoor shower off the main deck area. The four bedrooms include a large master on the first floor with queen-size bed, sitting area and private bath with double sinks. 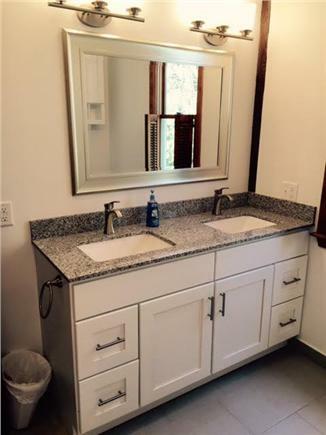 The master bath and first-floor laundry/lavatory were updated in 2016. 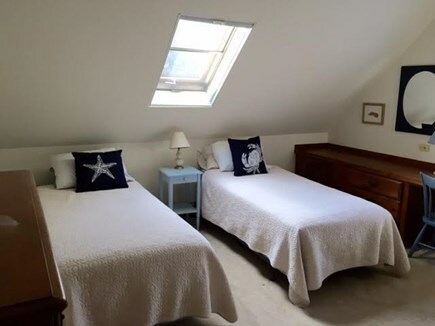 There are three more bedrooms upstairs, two with queen size beds and one with two twin beds. 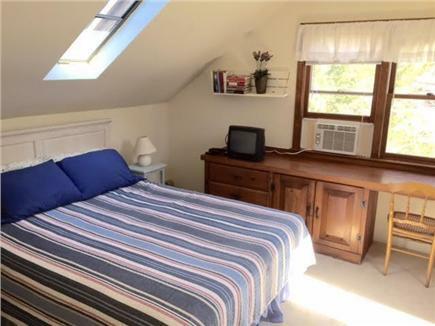 All the upstairs bedrooms have sky lights and air conditioning (window units). The yard has plenty of space for kids to play. The walk to Dyer Pond through paths in the woods of the National Seashore is simply spectacular. An assortment of puzzles, books, and games are provided for family fun after a day at the beach. Linens can be provided for an additional fee. Beach chairs are also provided. This is a unique and special property in a fabulous location. You won't want to leave. Long-Term Rental (1 month or more): Monthly rates available - October 2018 ($4,250). Will consider 2018-2019 monthly off-season rentals. Please inquire. Additional pricing info: Electronic payments accepted via Venmo -3% transaction fee for credit card, no fee for debit payment, State and local taxes of 12.45% will apply. There is a very large first floor master bedroom. Laundry is also on first floor. We returned to Winterwood for the second year in a row. A lovely comfortable home within close proximity to town and ocean beaches without having to deal with the traffic on Route 6. Heidi is a wonderful host and we would recommend this rental to anyone. We had a great weekend! The property was large enough to accommodate different families and plenty of room for game nights. Everything you could need in terms of supplies were at the house. Beautiful home and location. My family and I had a amazing time in this lovely Wellfeet house! The house was plenty spacious for my husband, 2 teenage children, father and me. The house was clean, had an updated kitchen, and is nicely furnished. The location of the house is close to restaurants, shops and beaches. The owners were responsible and available during the week we were there. We plan on staying in this house next summer. I really think this is the perfect summer rental! My family and I just returned from our fabulous stay at Winterwood. Winterwood is a barn that was renovated into a lovely home, is full of unique charm and is very cozy and inviting. 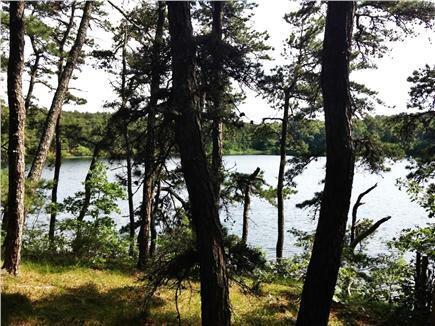 It's in a perfect location since it is just far enough away from Route 6 to have complete quiet and privacy but close enough to be able to walk to downtown Wellfleet and two gorgeous ponds! Our family of 4 greatly enjoyed our stay at Winterwood, which easily accommodated another family of 4 guests one night during our trip. The home is full of rustic charm and is well-planned to include all of the modern necessities plus a few extra touches that make for a comfortable and inviting vacation stay. Heidi is a very reasonable and responsive host, and we look forward to working with her to arrange future visits to her lovely home. We thoroughly enjoyed our week at Winterwood. Heidi was a gracious host and the house was great inside and out. 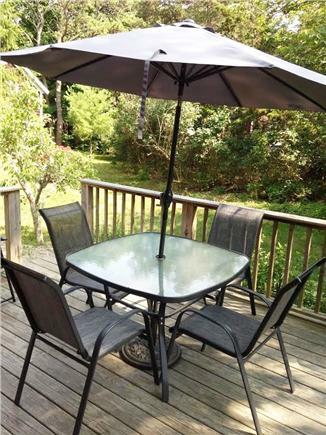 A lovely private yard, close proximity to Wellfleet center and the beaches, both easily accessible without having to get on Rt 6. I would highly recommend this rental, and we look forward to another trip to Winterwood. Heidi's place in the woods was perfect for our family of 6. The home is well stocked with cooking things, toys and games and bedding. Very comfortable and clean. Heidi was great to work with and very responsive. HIghly recommend! Heidi was incredibly responsive, gave clear and concise instructions, fair and clear house rules and made things easy. The list of local places to eat, to go and to see were terrific as well. The house has a warm rustic feel with all the modern conveniences you could want. Old recycled timbers with modern marble sink top bathrooms are combined extremely well. Winterwood is a historic and unique property with modern amenities. 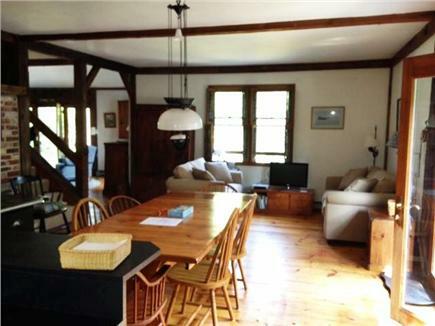 Originally a barn built in the 1850's, it was converted into a home in the late 1980's. Since that time, it was a popular and successful bed & breakfast inn and now is available for private rental. The open, spacious floor plan is conducive to family gatherings. The large master bedroom with brand-new bathroom is on the first floor, separated from the three upstairs bedrooms. The home really is perfect for gatherings of extended families. Character and charm abound at Winterwood, from the original barn board walls to the one of a kind stained glass window in the living area. The home is filled with abundant natural light. Winterwood's location is superb. 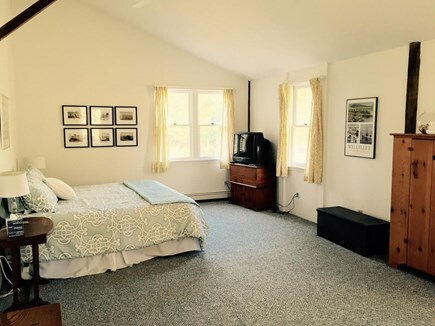 Walking distance to Dyer Pond and to the village of Wellfleet. 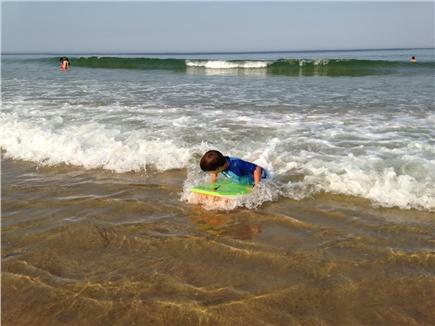 It is a short 5-minute drive to the magnificent ocean and bay beaches of Wellfleet. 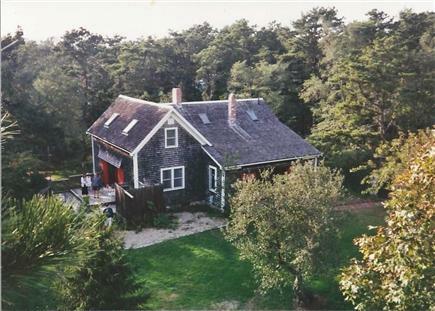 While being close to all that Wellfleet and the Outer Cape has to offer, the home feels secluded (although it is not). Guests can relax on one of two decks and feel a great sense of privacy.